The Tile Doctor's ongoing concern for consumers, installers, and the environment shows in its safe, non-toxic grout products. The Tile Doctor's grout products perform without the need for harmful chemical agents that can have negative impact on not only the environment, but on installers and the consumer as well. With so many environmental hazards present in products Americans use every day, many experts say the eco-system is suffering at even greater rates than ever before. Whether it's in health and hygiene products, the way food products are processed, or in the billions of tons of trash disposed of each year, the environment is at risk. There are even dangers present in products one might not normally think of, such as the grout used for tile installation in construction and home improvement projects across the country. The Tile Doctor not only recognizes these dangers to the environment, they have actually taken the steps to lessen the negative impact of grout and grout-related products on the market with superior non-toxic and eco-friendly grout. In fact, the Tile Doctor offers the only true high performance grout that has no negative impact on the installer or the environment. Cement grout and epoxy grout products, other than that of Tile Doctor's Litokol Grout, are labeled as hazardous and corrosive. They come with warnings about avoiding skin and eye contact as well as specialized disposal methods. Cement grouts often contain some type of anti-microbial additive to prevent the growth of mold and mildew from entering its porous nature. While this might make the products "appear" to be more effective, they are more dangerous than one might think. According to experts and environmental groups, these anti-microbials can be toxic and harmful if they make their way into bodies of water. The Tile Doctor is the exclusive US distributor of Starlike epoxy grout products. Starlike grout products are far superior to other epoxy grouts because they do not contain the harmful chemicals and they don't include any of the antimicrobial products found in some other epoxy grouts. The Tile Doctor's grout products perform without the need for harmful chemical agents that can have negative impact on not only the environment, but on installers and the consumer as well. The Tile Doctor is aware of this and is always looking for ways to ensure their products meet the highest standards of performance and safety measures. To this end, the Tile Doctor plans to continue its push to bring contractors and consumers the safest choice without sacrificing quality and performance. The Tile Doctor's Starlike epoxy grout products are always functional, aesthetically versatile, and safe for everyone. Starlike grout products are ideal for almost any surface and durable under even the most extreme conditions. Its Starlike grout products come in a range of styles and colors that bring over 159 colors and finishes to allow one to express themselves. Colors include classic and traditional colors for subtle appeal, glamour and glittering effects, metallic colors for a more modern approach, and translucent Starlike Crystal Glass Grout for bringing glass tile installations to life. See the Tile Doctor Color Chart page on its website for the full range of design possibilities. 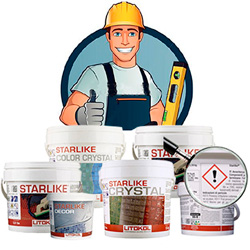 Whether one is a professional looking for easier, safer products or a homeowner looking for the best, most efficient grout products that are safe for kids, pets, and the environment, Litokol Starlike Grout is the absolute best product available. To learn more about the Tile Doctor superior tile epoxy grout products, and its line of sealers, cleaners, and maintenance products for tile installation projects, contact them today at 1-877-TileDoc (845-3362). To find a store nearby that sells Tile Doctor products, use the Store Finder option on its website.